Offer Details: 15% off all wine purchases/ free personal vineyard and winery tours daily from 11am to 1pm, with a special complimentary gift for parties of 6 or more. Hours: 11 am and 1 pm reservations available. BobDog Wines is a grower based winery. What does that mean? Well it’s basic. All great wines start with the vineyard__it’s the grapes. You cannot make a good wine from bad grapes. The key is to grow great grapes, and then have the Wine Maker build from there. As a winery, our priority is to handcraft the best grapes from the noble varietals we grow, and combine that treasure with the skills of the artisan wine maker. Consumer Education, (multi-media programs and hands on vineyard events for the consumer: the vineyard boot camp series; and our renowned: RedWine & BlueMusic Festival). The more the wine drinker knows, the more they want to know, with the result being: greater enjoyment through understanding.Our belief is that wine industry, (and so-called wine aficionados), are too much into the snobbery of wines. Swirl, Sniff, Sip and Spit! Forgotten is the basic fact: Wine is a food, meant to be enjoyed with food, family, and friends. In the end, wine should be drinkable, fruit able and approachable, from the day it is bottled. BobDog Wines will, therefore, be an iconoclast in the wine industry__emphasizing the fruit, frolic and folly of it all. Welcome to the home of ultra premium, award wining, handcrafted wine grapes. All five of the noble varietals are 2,000 feet, with panoramic views of the Russian River and Alexander Valley the vineyard blocks cling to steep hillsides and bench land vistas, featuring 8 separate micro-climates and soils, infusing the effects of terroir into each vintage. We invite you to take a seasonal journey, experiencing the growth cycle of our vineyards in a pictorial array, celebrating this unique location. Go to www.skypinevineyards.com for a great education. As a premium, boutique winery we offer incredible prices and support services to our customers. We can fashion for you a very competitive pricing structure which combines ultra premium quality with __value based” pricing. BobDog Wines, the highest winery in Sonoma County at 2000 feet, is nestled in the middle of Sky Pine Vineyards, and its 15 acres of red noble grapes, in the Alexander Valley. 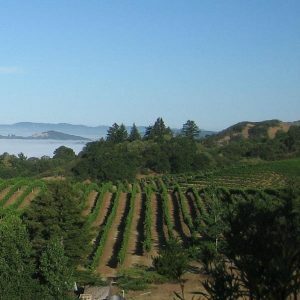 The heritage of six national awards will now be focused into a unique estate program with two brands: BobDog Wines at retail price points between $12 and $24 dollars; and Sky Pine Vineyards, Bordeaux style blends, with retail price points from $24.